Jurgen Klopp insists he never doubted Mohamed Salah as the Egyptian ended an eight-game scoring drought to help fire Liverpool back to the top of the Premier League. The title remains in City's hands, however, as the English champions have a game in hand. However, Liverpool continue to pile on the pressure in their pursuit to end a 29-year wait to win the league. Klopp's side appeared in danger of dropping valuable points until Salah intervened in the 80th minute to claim his 50th Premier League goal for Liverpool in only his second season at the club. "It was never in doubt that he was a great player in my side," said Klopp. "It was goal number 50 for Liverpool, an incredible number. He's very consistent." Salah has been criticised in recent weeks for being too selfish in front of goal in desperation to end his scoreless streak. When asked if he considered playing in the Brazilian, Salah told Sky Sports: "Not at all. As a striker you need to score. I made my decision to shoot." 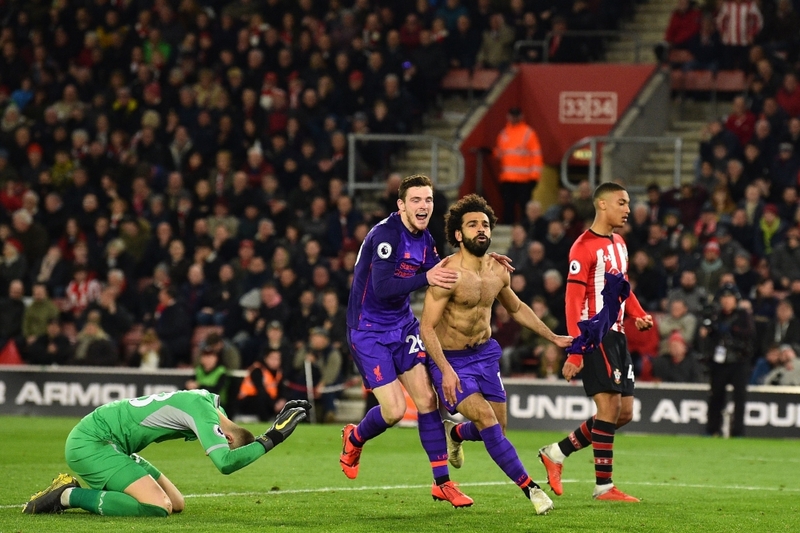 Liverpool were once again forced to demonstrate their resilience as they struggled to find their most fluent form after Southampton established a ninth-minute lead through Shane Long. Naby Keita equalised in the 36th minute with his first Liverpool goal but it was not until Salah struck that Klopp's side could be confident of moving two points ahead of City at the head of the table. Jordan Henderson wrapped things up in the 86th minute, but Klopp admitted his side were again not at their best, requiring late interventions just as they had in beating Tottenham Hotspur and Fulham in their previous two league games. "The performance was not top level but it is about fighting," he said. "People want us to play like Manchester City, we are unable to do that, we play our own football. "We have 82 points now, that is massive in this crazy league and everyone is waiting for us. I am really proud. It is incredible. "It is a difficult year for everybody, you need to have 70-75 points for the Champions League and 90-something for the title. We are in the race and that is nice." Klopp acknowledged the introduction of Henderson and James Milner midway through the second half fired up Liverpool's late rally. "Jordan Henderson came on and brought aggressiveness, verbal aggressiveness, we had direction again after that," he said. "We have to work for it, the moment will come but all three goals were brilliant. "It is nice for Naby Keita to score the first to show Southampton it will not be easy for them. After that we controlled it more. It was good, I liked it." Southampton remain five points clear of the bottom three and manager Ralph Hasenhuttl admitted his disappointment at his side's failure to hold on. "If you take the lead after five minutes, you are going in the right direction," said Hasenhuttl. "There is still a way to go but if you are a sportsman you are always frustrated if you are not winning. Not many have won against them this season, we had chances."